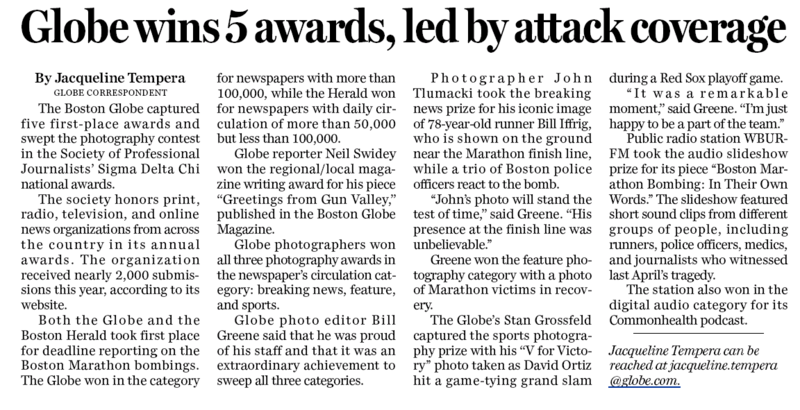 It’s awards season for newspapers right now, and Boston hit the dailies double in the latest journalism lovefest. Both the Globe and the Boston Herald took first place for deadline reporting on the Boston Marathon bombings. The Globe won in the category for newspapers with more than 100,000, while the Herald won for newspapers with daily circulation of more than 50,000 but less than 100,000. Actually, call it the frosty local tabloid. And call it a sore winner. This entry was posted on Thursday, April 17th, 2014 at 1:17 pm and is filed under Uncategorized. You can follow any responses to this entry through the RSS 2.0 feed. You can leave a response, or trackback from your own site.